Serpent Bohème Toi et Moi Ring S Motif Ring set with pavé diamonds, in white gold. In 1888, Frédéric Boucheron gave his wife Gabrielle a necklace representing a serpent. 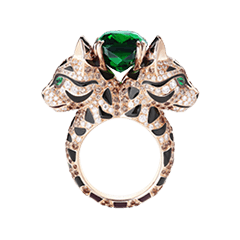 The Toi et Moi Serpent Bohème ring, a protective Talisman, pays homage to their love. The gold beads that crown the head of the snakes enhance the sparkle of the diamonds. The serpent curls around the finger and symbolizes the bond of love between two people. Serpent Bohème Ring S Motif Ring set with pavé diamonds, in white gold. A protective animal, the serpent is the keeper of the earth’s treasures and riches. The diamonds adorning the serpent’s head accentuate the radiance of the jewel and irresistibly catch the eye. The Serpent Bohème ring is the perfect creation for everyday allure. Curled around itself, this protective serpent symbolizes rebirth. The craftsman has reproduced the singular aspect of the serpent’s skin by sculpting the gold of this strikingly supple bracelet. The jewel wraps around the wrist and becomes the faithful companion of every moment. 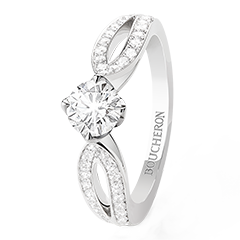 The Maison Boucheron is also renowned for the quality of the diamonds used in its creations. The stone setters use their savoir-faire to enhance the pieces by adding a magical radiance, as the impressive Serpent Bohème large ring. Serpent Bohème ear studs XS Motif Ear studs set with pavé diamonds, in white gold. The Bohème spirit is about the quest for an artistic ideal, in a way that is carefree, light-hearted and without constraint. This is the very essence of the Serpent Bohème collection. Ear studs that offer style for everyday and status for special occasions. 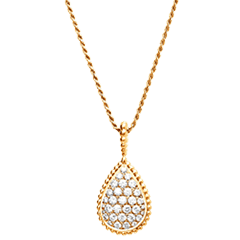 The drop motif is elegantly set with diamonds and bordered by gold beads. The refined honeycomb offers a sparkling effect and enhances the radiance of the diamonds. To give life to the gold, the craftsmen sculpt the metal, they push the gold into shape with hammers and chisels. This expertise, which requires utmost precision and skill, brings the serpent to life with the embossing of tiny scales that give a delicate grained texture to its skin. The expertise of the Maison Boucheron's Hands of Light is perfectly expressed with the bangle bracelet. Serpent Bohème ear studs S Motif Ear studs set with pavé diamonds, in white gold. 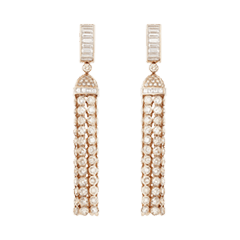 There are many drawings to be found in the Archives of the Maison that use the delicate honeycomb technique that enhances the radiance of the diamonds. 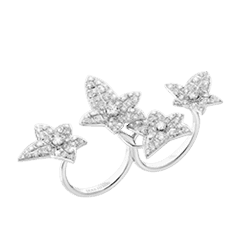 The diamonds of the ear studs sublimate the woman's face that will wear them. 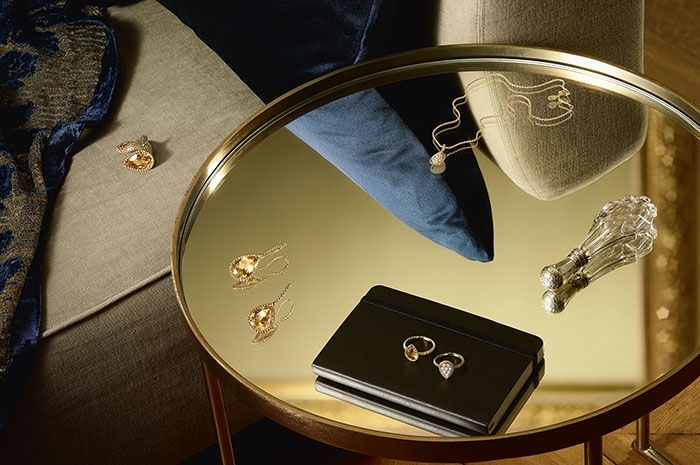 The Maison Boucheron is also renowned for the quality of the diamonds used in its creations. 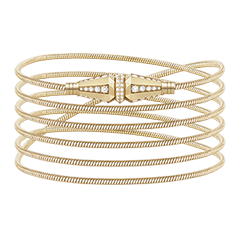 For the bangle bracelet, the two impressive drop motif are highlighted by the full diamond paved body. 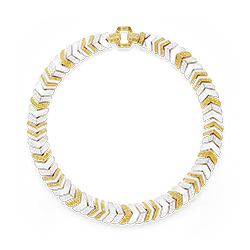 The reinterpretation of the Maison’s classics combined with new dimensions and contemporary style make this bracelet a quintessential and timeless Boucheron emblem. Serpent Bohème Sleepers L Motif Sleepers set with pavé diamonds, in white gold. The drop motif is elegantly set with diamonds and bordered by gold beads. The refined honeycomb offers a sparkling effect and enhances the radiance of the diamonds. Carried by this delicate work, the sleepers highlight the perfect sparkle of the diamonds and reveal new dimensions. 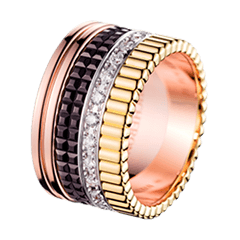 The ring’s body has been streamlined and is inspired by the rope chain motif, an iconic visual code for Serpent Bohème. The slender body offers the opportunity of wearing several rings together. Serpent Bohème Ring XS Motif Ring set with pavé diamonds, in white gold. Frédéric Boucheron, deeply in love with his wife, gave her a necklace representing a snake on the eve of one of his trips away. The protecarative animal watched over her when her husband was absent, and was a promise of a happy life. Since then, it has become a symbol of love and protecaration for all Boucheron women; a pledge of eternal attachment. The wedding band Serpent Bohème is the promise of a happy life beside one's beloved. Created in 1968, Serpent Boheme went through the years and became one of the most iconic collection of the Maison. On its twisted chain, the head of the snake is symbolized by a drop set with diamonds and crowned with gold beads. The honeycomb design allows the light to pass through, giving the stones even more sparkle. In white gold, this long necklace embodies the impertinence of the Maison Boucheron. Fine and feminine, this Serpent Bohème ring is now set with amethyst and crowned with gold beads. Its honeycomb update allows light to pass through, providing the gemstones with even more brilliance. 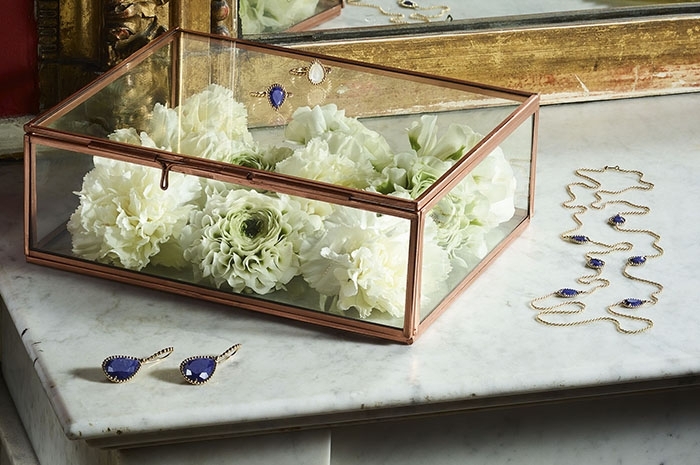 This aesthetic –particular to Serpent Bohème– perfectly reveals the craftsmanship and art of the jeweler. The twisted chain is a reference to the brand and pairs perfectly with the Serpent Bohème motif, which is why it is now thinner than ever. Classic, contemporary, and decidedly elegant, this amethyst and white gold pendant embodies the collection’s free spirit and femininity. Bordering on impertinence, Boucheron has subtly reinvented this Serpent Bohème bracelet, imagining an even more elegant allure. Its dainty white gold chain magnifies the teardrop shape adorned with amethyst, which symbolizes the head of the serpent. Serpent Bohème, the iconic collection created in 1968, has seventies influences and an alluring look. 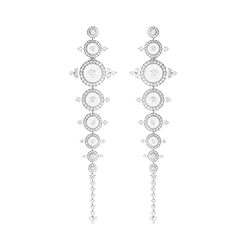 The large drop motif in this pair of white gold earrings set with diamonds is as extravagant as it is timeless. These Serpent Bohème sleepers in white gold set with diamonds will captivate you with their timeless and sensual design. Created in 1968, the iconic Serpent Bohème collection reveals the subversive daring of the Maison Boucheron. The Serpent Bohème pendant earrings in white gold set with diamonds echo the bohemian inspirations of the '70s. With their vintage spirit but timeless appeal, to wear Serpent Bohème is to assert your femininity. Since first emerging from the Maison's workshop in 1968, the Serpent Bohème Collection has endured over the years to become a Boucheron classic. This white gold pendant is set with diamonds and crowned with gold beads. Boucheron reinvents its Serpent Bohème bracelet, from the Maison’s iconic collection. Its delicate pink gold chain features both femininity and elegance, and makes a subtle diamond-set, XS drop-shape wrist ornament.